This 20 volume commentary (or collection?) contains unique, expository articles on "The Great" texts of of Bible. Filled with analogies, history, sermons, anecdotes, interpretations, and perspectives, this resource focuses on epic Bible texts that leap from your Bible's pages. While not a devotional work, devotional undertones do run throughout this resource. One modern pastor reflects, "I’ll sometimes be stuck on some passage and wander over to this Hastings guy to see if it was a text that he thought was “great”. If it was, I read him, and I never leave his feet disappointed." 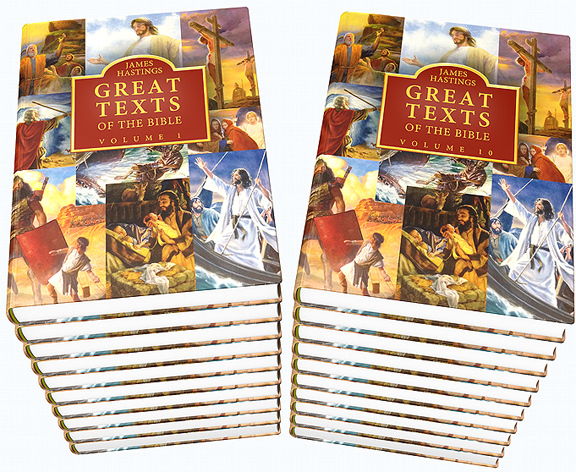 As with his companion work, Greater Men and Women of the Bible, Hasting provides insight and personal observations on the "Great Texts" of the Bible. Where as the Greater Men and Women of the Bible is organized by person, The Great Texts of the Bible is organized by scripture. Because Hastings studied the classics as an undergraduate, each section includes viewpoints from other authors, often with poems and literature quotes and references. And as with the companion work, this resource is organized not just by topic but by subtopic and various levels of outlining. You will find a lifetime of encouragement and clarity in The Great Texts of the Bible. James Hastings (1852-1922) was a Presbyterian clergyman and author. Hastings was born in Scotland, studied the classics at the University of Aberdeen, attended the Free Church Divinity College in Aberdeen, and was ordained a Free Church minister in 1884. Hastings was a prolific author. Hastings also compiled a number of dictionaries, such as the Hastings, James - Dictionary of the Bible (1909). The 20 volumes translates into about 25 megabytes of text. The download page shows a self installing version (exe file) and a manual install version (zip file). Each download file includes two e-Sword versions: 1) Commentary and 2) Reference Library. The content is identical. The only difference is the presentation (one is a commentary and the other is a Reference Library module). In my view, this work is a great commentary module. The drawback is e-Sword lacks the ability to easily or quickly see all comments in a commentary. Thus, you can click the Book View of the commentary version to see an index of all comments for that Book of the Bible. The Reference Library version is organized by Bible book and indented for easy reference (click screenshot thumbnail at the bottom of the file listing).